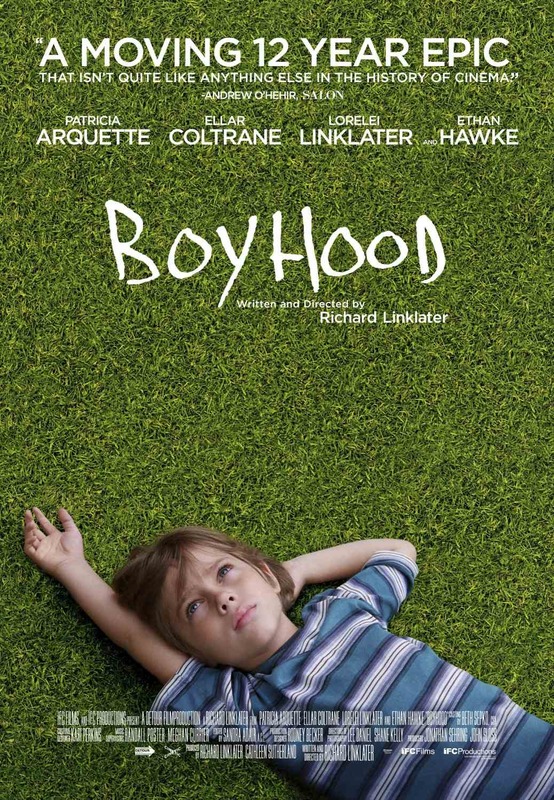 “Boyhood” should seem familiar to me, since I had one of my own. I know my life is based on a true story, and in a way, so is this movie. It begins with 6-year-old Mason (Ellar Coltrane from “Fast Food Nation”) growing up in rural Texas with his single mother Olivia (Patricia Arquette from “Girl in Progress”) and his older sister Samantha (Lorelei Linklater in her feature film debut). Life is tough for Mason, and that’s what this movie is about – his life. We follow Mason’s life from age 6 until he goes off to college. We have seen this kind of thing before, but not like this. They could have gotten a series of actors to portray Mason at various ages as the story unfolds, but that’s not what Director/writer Richard Linklater (“Before Midnight”) did here. The groundbreaking technique he used was to shoot for one month a year for 12 years. That’s right, it’s the same actor at age 6 as it is at 18. We also watch his mother, sister and father (Ethan Hawke from “Before Midnight”) age and change as people and how they relate to Mason. As for what happens next – well these things usually have a beginning, middle and an end. Maybe something like Mason gets into trouble, tries to fix it, gets deeper into trouble and in the end he comes out fine. Forget about that old three act standard – this a boy’s life. He is always getting in trouble and suffering the consequences and it seldom gets better. Even the good parts only look decent when they are in the rear view mirror. Most of the things that happen to Mason are out of his control because he is a kid. Most of the time he just has to deal with it. They have to move a lot, mostly to get away from his mother’s poor choice in men. Mason’s father hangs in for the part-time parent position in a way that seems real and rewarding for both of them. In fact, Mason’s dad matures along with him, which is something I can identify with myself. The patience it takes to wait for someone to come of age to complete a coming of age movie is astounding. Much like my life, there was no script and they made it up as they went along and grounded the story in the kind of person Mason grew into. The characters tell the story cloaked in the fabric of the real lives of the actors. Time marches on, and Mason elbows out his place in the world while his parents each separately try to figure out their own lives. The movie was touching, and it touched me in a very special place. For that reason I must give it 4 out of 5 stars. This is more than a slice of life – it’s the whole pie. 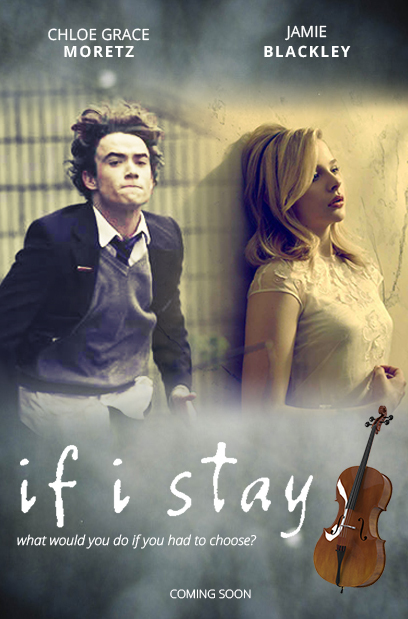 “If I Stay” is something I have thought about for the past two days, as I saw this movie on Thursday night. I still don’t know if I am coming or going. Mia (Chloe Grace Moretz from “Carrie,” 2013) has decided not to date boys in high school and wait for college instead. The only thing she wants to wrap her arms around is her cello, until Adam (Jamie Blackley from “The Fifth Estate”) asks her out. He’s the hot guy in school, a little older and in a band – all the signs for trouble. Her response is not typical movie-teenager-like. She is afraid – not of the guy – but of the way he makes her feel, and she sees him as a ticking time bomb about to explode all over her life. Adam does not fall for her because she is cute or quirky or because they have geometry together. It happens when he sees her play the cello. He sees her go to another place when she plays and he wants to know her. He wants to know this person who connects to music the way he does – even though her music is totally different that his. She is Beethoven and he is The Ramones. Still, it’s music and the love of great music that brings them together and somehow they find harmony. I don’t think I have to say spoiler alert to mention that Mia and her family are in a car wreck. Even the trailer lets you know she spends most of the movie in coma. This where I usually whine about all the flashbacks and the staccato rhythm of the narrative, but I can’t. This story requires this kind of ping pong timeline and a director like R.J. Cutler (“The Ordained”), who cares more about telling the story of two people than making a movie. His experience in documentaries serves him well as he lets the characters tell the story. We are completely drawn into to Mia’s world as we watch her life flash before her eyes. Here we see the complete human experience with the good and the bad and the rip-your-guts-out parts. These two people follow their bliss in a musical mash-up of moments amongst an amazing supporting cast. I did not read the book because they look at me funny when I linger in the YA section of the bookstore. My daughter/editor/mentor seemed to think the movie did well by the author’s version. I may have to go back to see the end of this movie again. I experienced some kind of medical phenomenon known as Water Under-Eye Syndrome (WUS) and in fact I think that theater may have been where the epidemic started. For avoiding clichés and giving us one of the best portrayals of young love I have ever seen, I am giving this movie 4 ½ stars out of 5. See it with someone you want to make beautiful music with. I saw “The Giver” today, and I got plenty out of it. Now I feel I need to give a little back. In this perfect world where everything is the same and there is no pain or suffering or war, people graduate from school and accept their appointed jobs in society. Jonas (Brenton Thwaites from “The Signal”) is nervous because he does not know what he wants, but he knows he is different. His best friend Fiona (Odeya Rush from “When the Devil Comes”) is selected for Nurturing and everyone else in the community gets a normal job except for Jonas. He is chosen to be the receiver of all the past memories. Jonas reports to the Giver (Jeff Bridges from “Crazy Heart“) who spends every day giving him all the memories of the past civilizations – before the sameness. He learns all the secrets of the world and the great highs and lows that mankind is capable of. Everyone else in the community gets an injection every morning that suppresses their emotions so they can’t feel anything. Personally, I take my injections at night. It’s tough for Jonas to find out his world is not perfect, and painful to know just how imperfect humans were in the past. When he skips his injections, he starts having feelings but there is nobody to share them with. Reminds me of when I was in fourth grade, but that’s another story. Jeff Bridges is a good choice to play the Giver, since he’s never been one to follow the rules. The weight of the wisdom has made him weary. It pains him to carry the burden of this knowledge, and he gives Jonas more than memories. He gives him the hope that he can change things. I hear this was first a young adult book, and it does make a grim fairy tale. The great solution to cure all the problems in the world is to make everyone willing zombies to the rule of law and order. It’s not what these people are taught, it’s what they are not told or allowed to become: human. This movie fits in the same basket as “The Hunger Games” and “Divergent” and even “The Village,” although less effort has gone into making this an action movie. Though I applaud the character conflict and the bizarre world, the movie felt light at 90 minutes. Jonas is left to carry the memories and the plot for everyone else. By design, the rest of the cast had nothing much to give. While it was nice sci-fi tale, it lacked the power this kind of thematic treatment of the flaws of humanity demands. For that reason, I have to give this movie 3 stars out of 5. They should have kept giving when the giving got good. “The Hundred-Foot Journey” does not sound like a big deal but it can take a lifetime to make the trip. Especially if someone else’s comfort food makes you uncomfortable. Hassan Kadam (Manish Dayal from “California Scheming”) grew up in Mumbai, India, cooking in his family’s restaurant. When the revolution comes, they lose everything and flee to Europe. When their truck breaks down in a little French village, they decide to settle there. His Papa (Om Puri from “The Reluctant Fundamentalist”) buys a rundown restaurant and is bent on bringing Indian cuisine to the French countryside. Unfortunately, just across the street, like 100 feet away, is a famous French restaurant run by Madame Mallory (Helen Mirren from “Hitchcock”). She ran the last guy out of business a decade ago and she decides this novelty act of Papa’s has to go. While Papa and Madame Mallory go to war, young Hassan has something cooking with one her chefs, Marguerite (Charlotte Le Bon from “Mood Indigo”). I should have known the way to a woman’s heart was not the drive-thru window. There is a good parable here about conflict. The things that divide these people – their races and their food – soon draw them together. It seems the spice of life is a little tastier when some new ingredients are added in. We fear what we don’t know and have never tried. It takes courage to experiment when the last time out it was brussel sprouts. The mix of off-beat characters coming out their shell is handled well by Director Lasse Hallstrom (“Salmon Fishing in the Yemen”). I found the old-style pace to be soothing, but then I like to enjoy a good meal. Sure, they could have cut 20 minutes out, but this kind of movie is meant to be savored. So it’s a little sentimental, and you can see it all coming after the first act, but that does not mean you can’t enjoy it. For that reason, I give this movie 3 ½ stars out of 5. It’s time to put down the cheeseburger and order something you can’t pronounce. I am feeling better the state of the world now that I have seen “Guardians of the Galaxy.” We are in good paws. Young Peter Quill (Chris Pratt from “The Lego Movie”) is having a rough day. His mother dies of cancer, and he runs outside the hospital seeking answers from the heavens. At that moment a light appears in the sky. Turns out it’s a spaceship that snatches him up and takes him away. Jump 26 years later to a barren planet where Peter has become a Ravager, which is a cross between Indiana Jones and Boba Fett. He’s looking for this magical Orb that everybody wants and other alien folks will pay him handsomely for. He finds the Orb, others find him and we are off to the space races. 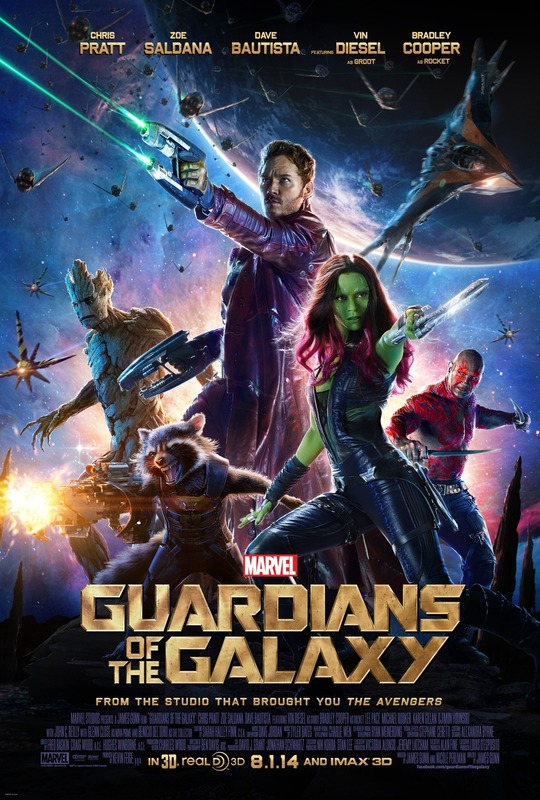 Some of the “things” that want the Orb and/or want to kill Peter become allies, starting with Gamora (Zoe Saldana from “Avatar”) whose “father” wants to destroy a bunch of other planets. Just out for the money is Rocket (Bradley Cooper from “The Hangover“), who is mostly a raccoon but you can’t say that to his snout, I mean face. His companion is, naturally, a tree called Groot (Vin Diesel from “Riddick”), who lumbers through the movie until his woodworking skills are required. The muscle is Drax (Dave Bautista from “Riddick”), who surprisingly had some of the most tender character moments. There is a whole intra-galactic Israeli-Palestinian thing going on here that Peter’s team gets dragged into. There is a lot going on in the movie, but the chase for the Orb keeps everything on track. Since Peter was taken from Earth in 1988 Earth, the futuristic sci-fi adventure is allowed to pull from our nostalgic ‘70s and ‘80s music and references. I have to admit that after seeing the trailer I wondered how all this was going to work. Now that I have seen it, I know that it all works, and I still don’t know how. The mood is dark and the tone is light. Most of the characters are not real, but you care about what happens to them. I could say that it was all derivative, but none of that mattered. The dang thing is just so entertaining, and for that I must give it 4 stars out 5. These guys can guard my galaxy anytime.